The ellipse is a very special and practical conic section. One important property of the ellipse is its reflective property. If you think of an ellipse as being made from a reflective material then a light ray emitted from one focus will reflect off the ellipse and pass through the second focus. This is also true not only for light rays, but also for other forms of energy, including shockwaves. Shockwaves generated at one focus will reflect off the ellipse and pass through the second focus. This characteristic, unique to the ellipse, has inspired a useful medical application. Medical specialists have used the ellipse to create a device that effectively treats kidney stones and gallstones. A lithotripter uses shockwaves to successfully shatter a painful kidney stone (or gallstone) into tiny pieces that can be easily passed by the body. This process is known as lithotripsy. Click here to see an animation of an ellipse reflection. As illustrated in the diagram above, when as energy ray reflects off a surface, the angle of incidence is equal to the angle of reflection. Extracorporeal Shockwave Lithotripsy (ESWL) enables doctors to treat kidney and gall stones without open surgery. By using this alternative, risks associated with surgery are significantly reduced. There is a smaller possibility of infections and less recovery time is required than for a surgical procedure. The lithotripter is the instrument used in lithotripsy. The mathematical properties of an ellipse provide the basis for this medical invention. The lithotripter machine has a half ellipsoid shaped piece that rests opening to the patient’s side. An ellipsoid is a three dimensional representation of an ellipse. In order for the lithotripter to work using the reflective property of the ellipse, the patient’s stone must be at one focus point of the ellipsoid and the shockwave generator at the other focus. 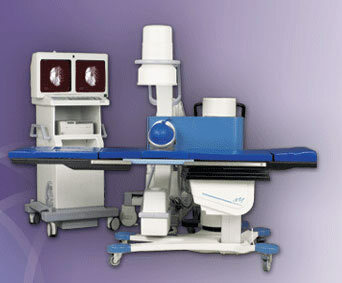 The patient is laid on the table and moved into position next to the lithotripter. Doctors use a fluoroscopic x-ray system to maintain a visual of the stone. This allows for accurate positioning of the stone as a focus. Because the stone is acting as one of the focus points, it is imperative that the stone be at precisely the right distance from the focus located on the lithotripter. This is essential in order for the shockwaves to be directed onto the stone. The lithotripter also contains a coupling device. This is needed for the successful transmission of the rays through the body. A cushion, somewhat like a water balloon, wraps around the half ellipsoid. The cushion is filled with water and rests against the patient’s side. The cushion is sealed to the patient’s body using a silicone membrane. It is the water that allows the shockwaves to travel through the body’s tissues safely because water and the soft tissue have the same density. The stone has a greater density and is shattered by the shockwaves, but the soft tissue suffers only minimal damage. Before the new lithotripters were made, patients would lay in a water bath to create the same effect. Electrohydraulic, piezoelectric, and electromagnetic energy systems use the focus of the ellipsoid to create the shockwaves needed to fracture the stone. The waves are generated at one focus and because of the elliptical shape, the waves are redirected onto the second focus, which is the stone itself. All of these waves cause the stone to crack and it eventually fragments into many tiny pieces that can then be easily passed by the body. The process of lithotripsy takes about an hour. The patient can usually return home the same day and is not subjected to a lengthy recovery that is frequently required after surgery. Lithotripsy is virtually painless. The vibration and noise of the shocks can be uncomfortable and so most patients require minimal anesthesia. For these reasons, lithotripsy is becoming a popular treatment for many patients.